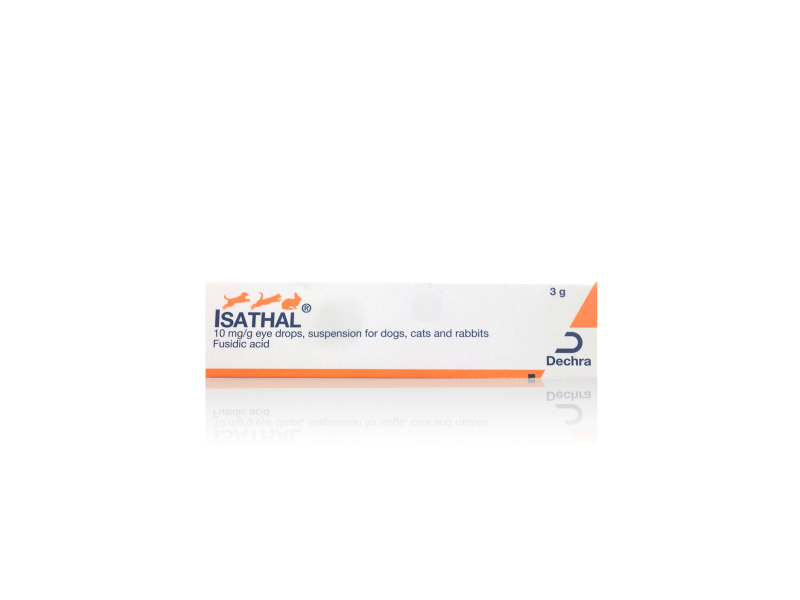 Isathal is used in dogs for the topical treatment of conjunctivitis associated with Staphylococcus aureus and in particular the biotype Staphylococcus intermedius. In cats for the topical treatment of conjunctivitis associated with secondary staphylococcal infections and in rabbits for the topical treatment of conjunctivitis associated with staphylococcal infections. 1 g suspension contains: Active substance: Fusidic acid 10 mg Excipients: Benzalkonium chloride 0.11 mg as antimicrobial preservative. Disodium edetate 0.5 mg as co-preservative. Eye drops, suspension. A sterile, white to off-white, viscous formulation. Dog: For the topical treatment of conjunctivitis associated with Staphylococcus aureus and in particular the biotype Staphylococcus intermedius. Cat: For the topical treatment of conjunctivitis associated with secondary staphylococcal infections. Rabbit: For the topical treatment of conjunctivitis associated with staphylococcal infections. The veterinary medicinal product should not be used in conjunctivitis cases associated with Pseudomonas spp. Do not use in cases of known hypersensitivity to the active substance or any of the excipients. In cats, the possibility of a primary cause of the conjunctivitis should be investigated and treated if possible. In rabbits, conjunctivitis may be associated with dacryocystitis and/or dental disease. In such cases, appropriate additional treatment should be instituted. Official, national and regional antimicrobial policies should be taken into account when the product is used. For external use only. When the tube is squeezed, the veterinary medicinal product comes out as a thick (viscous) drop. The drop quickly becomes liquid on contact with tear fluid and does not affect the sight. Care should be taken to avoid contamination of the contents during use and to avoid the nozzle of the tube coming into direct contact with the eye. Avoid fingers touching the tube nozzle. Do not use the same tube to treat different animals. Wash hands after applying the product. Allergic reactions or hypersensitivity to the active substance or the excipients might occur. Discontinue use if hypersensitivity to the product develops. One drop of the veterinary medicinal product should be instilled into the eye once or twice daily. Treatment should be continued for at least 24 hours after the eye has returned to normal. If a clinical response is not evident after 5 days following the commencement of administration, the diagnosis should be re-established. If the animal has one infected eye, it may be advisable to treat both eyes to prevent cross-infection. In such cases, it is better to treat the uninfected eye first to avoid transferring infection via the tube nozzle. Not for use in rabbits intended for human comsumption. Fusidic acid, the active substance of the veterinary medicinal product, is active against Staphylococcus aureus and in particular against the biotype Staphylococcus intermedius which is a common isolate from clinical cases of canine conjunctivitis. In the cat, ocular bacterial infection is usually secondary to viral, Chlamydia or Mycoplasmal infection or trauma. Among the variety of bacteria found, the Staphylococcus spp. are considered to be sensitive to fusidic acid. In the rabbit, ocular infections are associated with a variety of organisms, which are sensitive to fusidic acid, the most common of which are Staphylococci. The sustained release formulation of the veterinary medicinal product ensures prolonged retention within the conjunctival sac. Once or twice daily applications will provide inhibitory levels of fusidic acid against the sensitive organisms. Studies have shown that fusidic acid penetrates well into the cornea and anterior chamber in humans and rabbits. Shelf life of the veterinary medicinal product as packaged for sale: 3 years. Shelf life after first opening the tube: 1 month. Do not store above 25ËšC. Replace the cap between applications. Following withdrawal of first dose, use the product within 1 month. Sterilised aluminium tube laminated on both sides of tube wall with high density polyethylene, with a high density polyethylene nozzle closed with a high density polyethylene screw cap. Pack sizes: Available in a carton containing a 3 g and 5 g tube. Not all pack sizes may be marketed. For animal treatment only. To be supplied only on veterinary prescription. Keep out of the reach and sight of children. Excipients: Benzalkonium chloride 0.11 mg as antimicrobial preservative. Disodium edetate 0.5 mg as co-preservative. Dog: For the topical treatment of conjunctivitis associated with Staphylococcus aureus and in particular the biotype Staphylococcus intermedius. Cat: For the topical treatment of conjunctivitis associated with secondary staphylococcal infections. Rabbit: For the topical treatment of conjunctivitis associated with staphylococcal infections. The veterinary medicinal product should not be used in conjunctivitis cases associated with Pseudomonas spp. Do not use in cases of known hypersensitivity to the active substance or any of the excipients. In cats, the possibility of a primary cause of the conjunctivitis should be investigated and treated if possible. In rabbits, conjunctivitis may be associated with dacryocystitis and/or dental disease. In such cases, appropriate additional treatment should be instituted. When the tube is squeezed, the veterinary medicinal product comes out as a thick (viscous) drop. The drop quickly becomes liquid on contact with tear fluid and does not affect the sight. Care should be taken to avoid contamination of the contents during use and to avoid the nozzle coming into direct contact with the eye. Avoid fingers touching the tube nozzle. Do not use the same tube to treat different animals. One drop of the veterinary medicinal product should be instilled into the eye once or twice daily. Treatment should be continued for at least 24 hours after the eye has returned to normal. If a clinical response is not evident after 5 days following the commencement of administration, the diagnosis should be re-established. If the animal has one infected eye, it may be advisable to treat both eyes to prevent cross-infection. In such cases, it is better to treat the uninfected eye first to avoid transferring infection via the tube nozzle. Pharmacotherapeutic group: Ophthalmologicals containing antibiotics. Fusidic acid, the active substance of the veterinary medicinal product, is active against Staphylococcus aureus and in particular against the biotype Staphylococcus intermedius which is a common isolate from clinical cases of canine conjunctivitis. In the cat, ocular bacterial infection is usually secondary to viral, Chlamydia or Mycoplasmal infection or trauma. Among the variety of bacteria found, the Staphylococcus spp. are considered to be sensitive to fusidic acid. In the rabbit, ocular infections are associated with a variety of organisms which are sensitive to fusidic acid, the most common of which are Staphylococci. The sustained release formulation of the veterinary medicinal product ensures prolonged retention within the conjunctival sac. Once or twice daily applications will provide inhibitory levels of fusidic acid against the sensitive organisms. Studies have shown that fusidic acid penetrates well into the cornea and anterior chamber in humans and rabbits. Shelf life after first opening the tube: 1 month. Do not store above 25˚C. Replace the cap between applications. Following withdrawal of first dose, use the product within 1 month. Sterilised aluminium tube laminated on both sides of tube wall with high density polyethylene, with a high density polyethylene nozzle closed with a high density polyethylene screw cap. Pack sizes: Available in a carton containing a 3 g and 5 g tube. Not all pack sizes may be marketed. 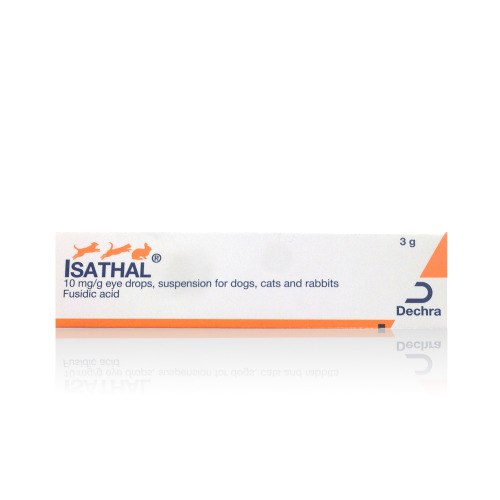 Below are some recent questions we've received regarding Isathal 10 mg/g Eye Drops for Dogs, Cats and Rabbits (Formerly Fucithalmic), including answers from our team. My dog is prescribed Isathal by my vet. His problem began with dry eyes and he is now nearly blind. While using Isathal his eyes are clear and healthy looking regardless of his sight deficiency, but as soon as I stop treatment they clog up again with mucous and often become inflamed. My question is "Is it safe to use Isathaal continuously?" It is certainly safe to use Isathal long term though the risk is that eventually a population of bacteria resistant to Isathal will develop and then it will no longer be effective. If this does happen you would need to switch to a different antibiotic eye ointment.